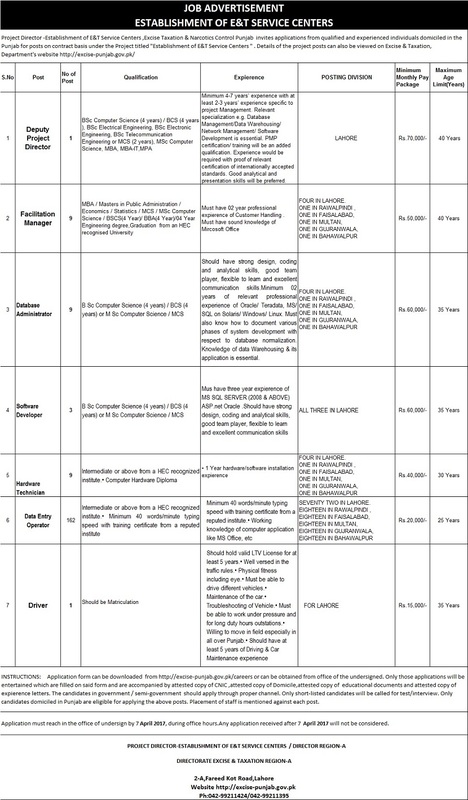 Project Director Establishment of E&T Service Centers Excise, Taxation and Narcotics Control Government of Punjab invites application from qualified and experienced individuals domiciled in Punjab for posts on contract basis under the project titled "Establishment of E&T Service Center." Note: Details about the qualification of the jobs is mentioned in the advertisement given below. Application form can be downloaded from the link given above or www.excise-punjab.gov.pk/FC . Duly filled application form along with copy of CNIC, domicile, educational documents and experience letters may be sent to the following address. "Project Director of Establishment of E&T Centers Service Centers / Director Region-A Directorate Excise and Taxation Region-A, 2A Fareed Kot Lahore." Note: All documents should be attested.